The Australian Ballet is performing its new production of Khachaturian’s Spartacus. Much of the action takes place in southern Italy, in locations both familiar to modern travellers and well off the beaten track. According to the most important ancient sources for the Spartacus story – Plutarch and Appian – the Thracian gladiator and his band of up to perhaps 10,000 comrades undertake a veritable Grand Tour of southern Italy before meeting a grisly end on the southern tip of the peninsula. Armed with a recording of Khachaturian’s stirring music and the ancient texts, a ‘Spartacus tour’ offers a refreshing alternative to mass tourism for either the actual or armchair traveller. So, ditch your Lonely Planet and let the music guide you. The action of Khachaturian’s ballet varies considerably from the historical sources, but the most important dramatic element, the struggle between the Roman general Crassus and the Thracian rebel Spartacus, is true to the historical narrative. The story takes place in 73-71 BCE, a century before Rome had formed itself into an all-conquering empire. Much like today, southern Italy did not willingly submit to the power of Rome. Rather, there had been centuries of war involving allies (the so-called ‘Social Wars’) as well as decades of invasion by Hannibal and other Carthaginian generals in the Punic Wars. Indeed, the uprising of Spartacus and his band was the third outbreak of the Slave Wars, where downtrodden, mostly foreign, slaves rose up against their Roman masters in both Sicily and southern Italy. All these uprisings were dealt with savagely, with crucifixion a not-infrequent punishment for those who posed a threat to the Roman state. Although Spartacus is the key figure in the Hollywood film and the ballet, ancient writers were more interested in his nemesis, Crassus. A great general, Crassus, along with Julius Caesar and Pompey, went on to form the ‘first triumvirate’, the three men who ruled Rome in the time of the Civil War. Khachaturian is unsparing in his characterisation of Crassus, presenting him as a harem-keeping, orgiastic sponsor of gratuitous pleasure killings. At the height of the Cold War, Khachaturian no doubt had good socialist motives for presenting the aristocratic Crassus in this light. Our Spartacus tour begins in Capua, mid-way between Rome and the Bay of Naples on the ancient Appian Way. Built in the third century BCE, the Appian Way was the main military road between Rome and the south, and both Spartacus and Crassus would have used the road extensively during their struggle. If you are travelling by car from Rome, you can still follow the route of the Appian Way (modern state road SS7) along the coast, perhaps visiting the Appian Way National Park, where you can still walk along remote sections of the Roman road, little changed since Spartacus’s day. 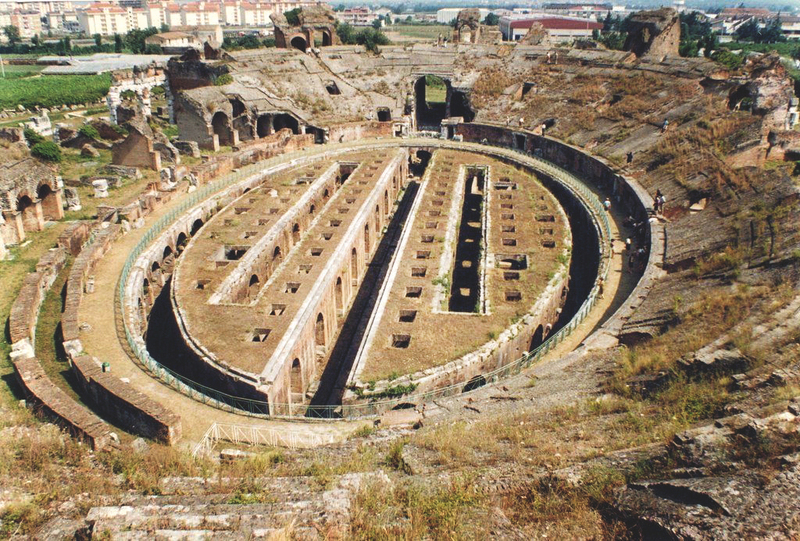 In Capua you can explore the ruins of the amphitheatre, the world’s oldest, dating from just before the time of Spartacus’s revolt. The underfloor area of the amphitheatre, where both animals and gladiators were kept, is still remarkably well preserved, but unfortunately most of the stones of the upper levels were carried off by the Normans to build the medieval town, so it’s not as impressive as, say, the Colosseum. Importantly for our story, Capua was the site of Rome’s most important Gladiator ‘school’, run by an entrepreneur called Lentulus Batiatus. Spartacus, a captured Thracian tribesman, was one of Batiatus’s star attractions, described by Plutarch as having “not only a great spirit and great physical strength but…was most intelligent and cultured, being more like a Greek than a Thracian”. Adjacent to the amphitheatre at Capua is a small but worthwhile Gladiator Museum, containing helmets and weapons, as well as numerous stone fragments showing us gladiators in action and telling the story of Spartacus. According to the sources, the uprising begins when Spartacus, along with about 70 of his fellow gladiators, escape the camp in Capua, armed only with kitchen utensils. They head south and are joined by herdsmen and shepherds on the slopes of a mountain, which we know today to be Mount Vesuvius. In Spartacus’s day the volcano had not yet destroyed the towns of Pompeii and Herculaneum, and so it is referred to as just a steep mountain. Furious fighting took place, with Spartacus’s men using vines to lower themselves down the steep slopes of the volcano and surprising the Roman forces by attacking their rear. The Romans fled and Spartacus’s reputation grew. 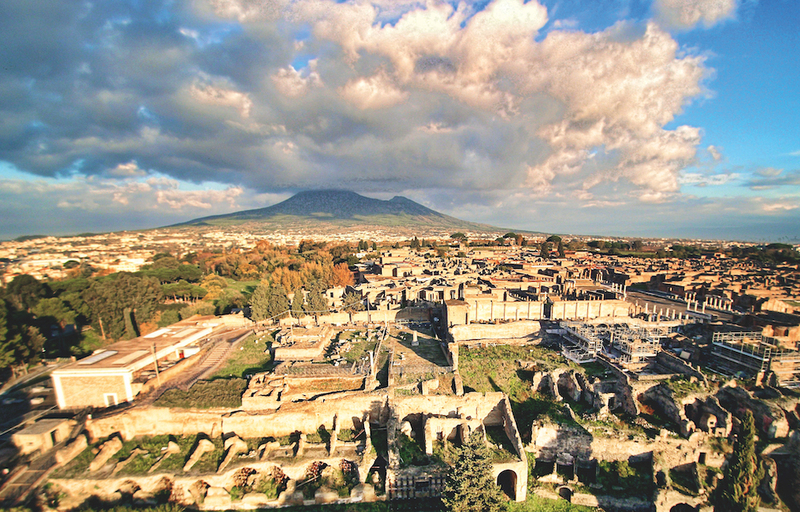 Today, Mount Vesuvius is best approached by car from the archaeological site of Herculaneum. The steep winding road takes you through vineyards and small towns before emerging onto the rugged lava and ash filled slopes of the upper mountain. It’s a steep 45-minute walk from the car park to the rim of the volcano, but you are rewarded with fine views over the Bay of Naples and down into the sleeping crater. Look down. It’s easy to imagine Spartacus and his followers slipping down the side of Vesuvius and surprising the Romans! A worthwhile detour just a few kilometres from Vesuvius is the Roman Villa at Oplontis, within the modern town of Torre Annunziata. This vast pleasure villa features an Olympic-sized swimming pool, halls, dining rooms, colonnades and room after room of superbly preserved frescoes, depicting history, mythology, birds, plants, animals, theatre masks, Gods and Goddesses. We can’t be sure who owned the villa, but it must have been one of Rome’s most important families. Act II of Khachaturian’s ballet takes place in such a villa, a place of seduction and excess, so it makes a most suitable segue from the wilds of Mount Vesuvius. It’s also far less visited than Pompeii and Herculaneum, making it a pleasure to explore. From this point on, the Spartacus story gets a bit confusing. Some sources have the action shifting to northern Italy, as Spartacus and his largely Germanic and Thracian followers attempt to make a dash across the Alps to their homelands. Others describe battles taking place in the Apennines, Italy’s central mountains, and further south along the Adriatic coast. It appears the rebels were divided, some wanting to cut and run, others wanting to wait for the right opportunity to strike the Roman forces and perhaps even march on Rome itself. However, we can be sure that the final episode takes place near Reggio di Calabria, on the southern tip of Italy’s toe. Here, according to Plutarch, Spartacus was attempting to cross the Straits of Messina to Sicily where he would have found support among the many slaves indentured on the island’s farm-estates. But Spartacus was let down by the ship owners with whom he had contracted to cross the Straits, and Crassus had him pinned down. Crassus builds a 60km ditch and wall, trapping the rebels and slowly starving them into action. Spartacus and his men break through, but are chased and defeated by the Romans bringing the rebellion to an end. Spartacus himself is killed by two centurions as he attempts to personally attack Crassus. Reggio di Calabria was founded in the eighth century BC by Greek colonists, making it one of Italy’s oldest cities. It’s a pleasant seaside town, looking across to Sicily and protected by the towering mountains of the Aspromonte range, the southernmost tip of the Apennines. It would have been quite a feat for Spartacus to escape across these mountains. The highlight of modern-day Reggio di Calabria is undoubtedly its archaeological museum, containing two celebrated classical Greek sculptures, the ‘Riace Bronzes’ found nearby and dating from the 5th century BCE. And make sure you stop in at the Gelateria Cesare just across from the archaeological museum. It’s one of Italy’s best, and you’ll need it to cool your passions after following the story of Spartacus across southern Italy. 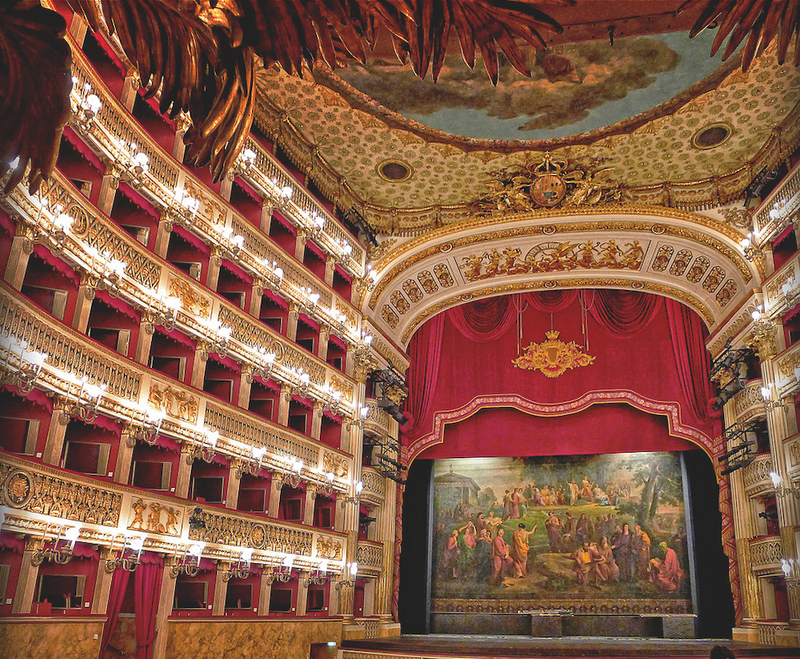 If you are a music lover travelling through Southern Italy, make a detour to Naples to see the Teatro San Carlo, one of Italy’s most beautiful opera theatres. In the 18th century, Naples was at the heart of Europe’s musical life. Composers of the Neapolitan school, such as Porpora, Paisiello and Cimarosa set the fashion for both opera seria and opera buffa, while castrati such as Farinelli and Cafarelli were products of Naples’ musical conservatoria. In the 19th century, the San Carlo saw the premieres of works by Rossini, Donizetti, Bellini and Verdi.